What makes Swing Trading Methodology at Stock Reversals Premium unique? SEE OUR TRACK RECORD ONLINE! Don’t have time to monitor the market all day? Need fresh ideas that work? Tired of buying high and then selling low? Need profit potential with less risk and volatility? Consider what we do at SRP every day for our Members… and get a 30% discount coupon at the bottom of this article to join now and start making regular profits!! In our Stock Reversals Premium swing trading service, we use behavioral analysis, charting techniques and fundamental trading discipline to make sure we are taking the best opportunities for trade setups and profit taking. Our 70% hit rate since 2013 inception is evidence of the fruit from our process and approach. We don’t just look at the charts. If there’s a fundamentally poor company whose stock looks technically good to us, we will generally shy away from considering it as a swing opportunity, even if there are profits to be made. We prefer not to wake up in the morning to bad surprises, and being diligent with the fundamental analysis helps reduce errors. Requiring strong fundamentals, balance sheets, proper share structures, management and more out of a swing trade candidate reduces mistakes and improves long term performance for our Members. We use stops near close of market day not intra-day as most traders do. We can’t tell you how many times stocks get flushed throughout a trading day only to rebound most if not all of the days paper loss by the close. Computer programs are notorious for “stop hunting” at likely stop points (round digits, chart support areas, and the like) and will generate sell programs to wipe out the stops. At SRP, we pay attention to our stop out levels generally 15 minutes before close. We have had many trades that would have been stopped out had we not employed this method. This also is a key ingredient to our successful market beating track record since 2009 at The Market Analysts Group. 8% Sell 1/2 Rule. Disciplined Profit Taking!! If any swing trade is up 8% or from average entry, we sell 1/2 of the position no questions asked. We have found that this is a consistent way to be unbiased in taking profits and makes sure that your risk levels stay in check and profits are booked. We then often ride the final 1/2 higher if possible and adjust the stop accordingly. We actively monitor and manage our positions. We update members every single morning in a Pre-Market report on where the positions are, stop points, target prices and an overall view of the broad market for the day. Generally speaking, our Model Portfolio (assuming 10% = a full position) has never been more than 50-60% invested at any given time. This allows us to reduce risk for the overall portfolio by always keeping cash on hand. We are not afraid to close out a position into strength and move on to the next opportunity. 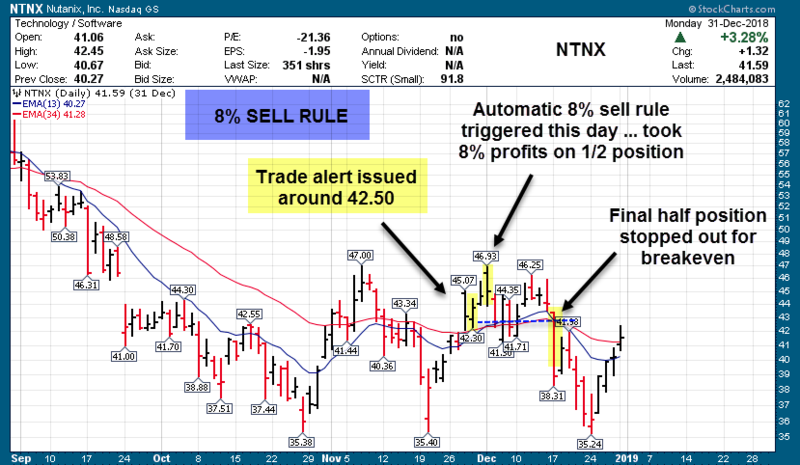 Here is an example of where our 8% Sell Rule kept positive overall profits, even when the trade did not go as planned. Also, here is our 2019 Model Portfolio performance. Our last 13 trades have been profitable on average of +13%!! We have out-performed the SP 500 every year since Sept 2013 inception with less risk. YTD up about 16.5% in 2019. 1 day hold, 15-18% average gains! 4 day hold, 25% average gains! 5 day hold, 15% average gains! These last few trades alone would have paid for a year’s subscription on a 5,000 initial investment! 70% success rate since September 2013 inception at our Premium Service! 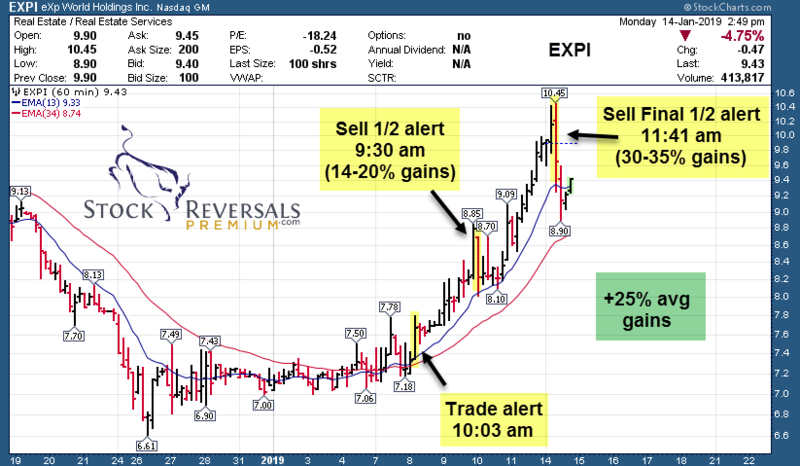 At our Stock Reversals Swing Trade Premium service we send an SMS text, E-mail, and SRP Members only Blog Post with details on the company, entry and exit advice, stop loss parameters, plus SMS text and E-mail alerts to sell, morning reports every day covering all positions pre-market, ongoing strategy and trading advice, market forecast models updated daily, and 24/5 access to our Chief Strategist. 30% off Monthly, Quarterly, or Annual Membership using Coupon Code: PSFFT5NWT1 Makes it $69 monthly, $149 quarterly, or $524 Annually. Enter Coupon Code in Checkout area in Coupon Field.